In a large mixing bowl, add shrimp, half the garlic, one tablespoon of parsley, and half the lemon juice. Toss well to combine. Season with salt and black pepper. Set aside. Bring a pot of water to a rolling boil on medium high heat. Season generously with salt. Add spaghetti and cook until cooked (about 8 minutes - don't over cook!). Drain and put back in the pot. Drizzle about one tablespoon of extra virgin olive oil and add one tablespoon of butter. Add half the parmesan cheese and one tablespoon of parsley, toss to combine. Season to taste with salt and black pepper. Keep warm. In a large deep sided pan on medium to high heat, add a tablespoon of butter and a tablespoon of olive oil. When pan is hot, add shallots and saute until soft. Turn heat to high and add shrimp and garlic. Toss quickly for about 2 to 3 minutes or until shrimp is cooked and pink in color. Add lemon juice and toss to combine. 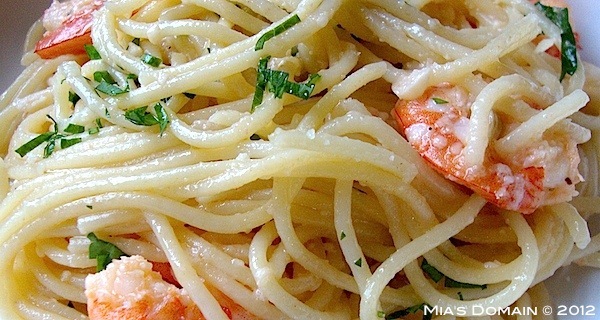 In a large serving bowl, combine and toss spaghetti and shrimp. Serve hot and sprinkle with parsley and freshly grated parmesan cheese.